This lesson can be used as a pre-lesson for the Characters Change Just Like We DoLesson plan. Students will be able to identify character changes in a text using text evidence. Students will be able to identify and discuss character changes in a text with sequencing words using a graphic organizer. 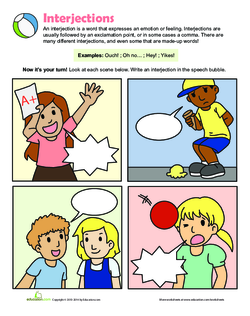 Project the Interjections worksheet and label the pictures one to four. Ask students to focus on the emotions each character feels in the picture. Draw four boxes on the board. Gather background knowledge by distributing four sticky notes to each student and asking them to write how each character feels and the evidence they have for their choice. Tell them to place their sticky notes in the correct numbered box on the board. Allow them to share their answers with their elbow partner and monitor their conversation to see who uses correct sentences and vocabulary to describe the character's emotions in the picture. Write their feeling words on the board as a list to add onto later. Explain to students that today they will not only look at the pictures and text of a picture book to determine a character's feelings, but they will make claims about how the character changed throughout the story. Complete a picture walk of the book Ava's Spectacular Spectacles. As you turn the pages and examine each picture, highlight the conflicts and actions they can see in the illustrations. Point out the potential problem and the character's actions from the pictures. 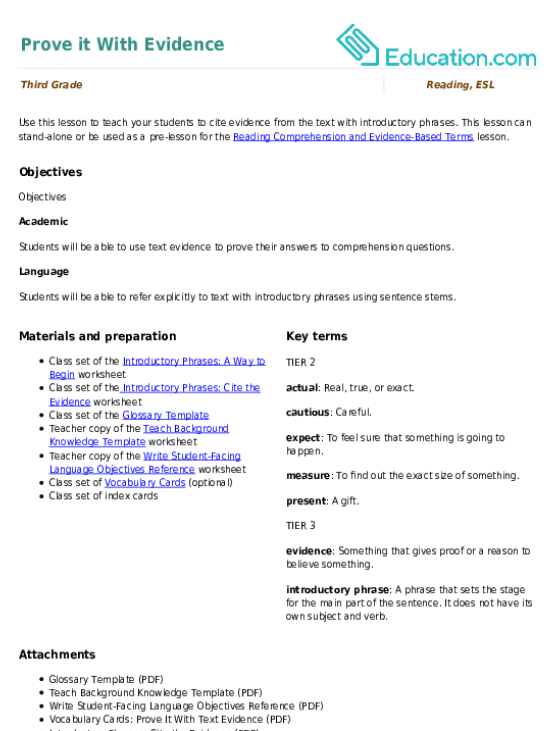 Define ProblemAnd SolutionAnd provide a familiar topic as an example. For instance, "I forgot my homework on the bus, but my friend saw it and brought it to class for me." Write the problem and solution from your example on the board. Tell students today they will make claims about the changes Ava makes throughout the book and look for evidence to support their claim. 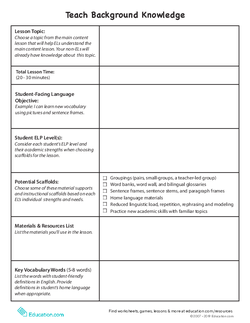 Define Claim, Text evidence, Actions, and DialogueUsing the Vocabulary Cards and Glossary worksheets. Preview the pictures in the book one more time and then ask students to turn to their partners and make a claim about how Ava will feel in the beginning of the book. Then, flip to the end of the book and ask them to make a claim about how she will feel at the end of the book. Rephrase one student's answers using sequencing terms. For example, "____ thinks Ava is discouraged in the beginning of the story because her head is dropped down and she's not doing any work while everyone else is finished with their work." Explain to students that sometimes the problem in the story makes the characters feel a certain way. Then, when they have a solution, they feel a different way. Tell them you're going to read Ava's dialogue and get a better idea of how her feelings changed throughout the story. Read the book Ava's Spectacular Spectacles. As you read, continually refer to the pictures that show Ava's actions and body language, and then mention the dialogue she has with her teacher. Add more feelings to the list on the board as you read the text. Ask elbow partners to turn and share how they think Ava felt at the end of the text. Encourage them to use the list of feeling words from the board. 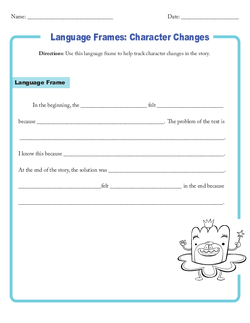 Display the Language Frames: Character Changes worksheet and read through the sentence frames aloud. Circle the sequencing words and highlight that these words will help them make clear claims about a character's feelings at specific moments in a text. 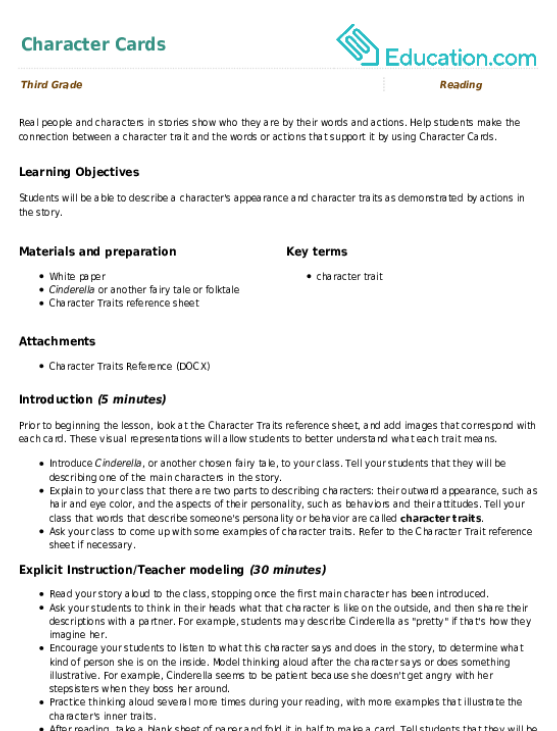 Model using a sentence frame. For example, "Ava's problem was she did not want to use her spectacles. I know this because she left them in her school bag." Separate students into groups of three to four students and distribute three index cards to each student. Explain they'll play a paper toss response activity where they'll write one answer to each question on an index card, crumple it up so they have three balled papers total, and then toss them in the middle of the group. Then, each student will take turns reading the response and sorting it into two groups: agree or disagree. The group members will then debate their answers. How does Ava feel in the beginning of the story? What pictures in the text show you that Ava feels this way? How does Ava feel in the middle of the story? What pictures of the text show you that Ava feels this way? How does Ava feel by the end of the story? Allow one group to share one of their agreements or disagreements. Ask students to think about their claim about Ava's feelings from the Word Level Focus section and share with their elbow partner if they made the correct choice. Ask them to adjust their prediction to match the dialogue text evidence. Encourage students to refer to their Vocabulary Cards in all their pairs and whole group responses. 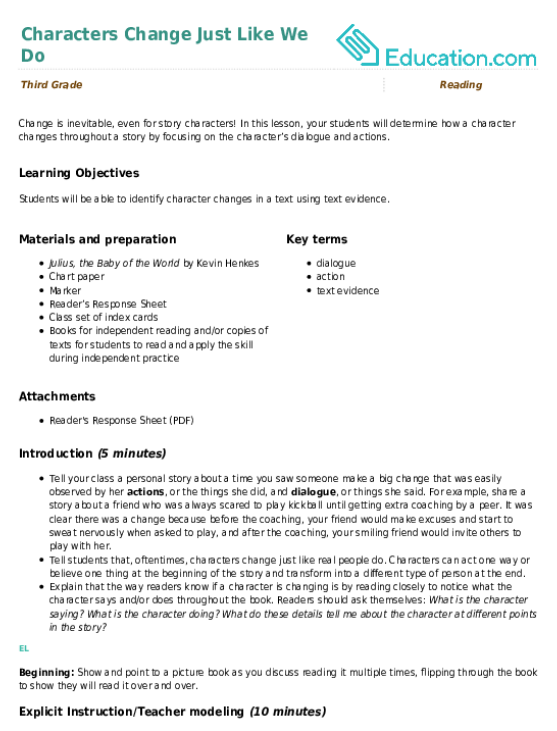 Also, allow ELs to give their answers in their home language (L1). 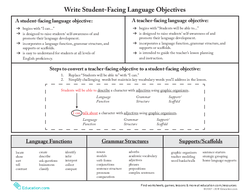 Provide sentence frames from the beginning of the lesson and write your oral responses with the sentence frames as an example for them to follow and reread. Provide a simple list of feeling terms they're familiar with for them to use in their sentences. Ask students to use sentence stems and the text to write a paragraph about Ava's character changes throughout the story. Prompt ELs to mention the reasons for Ava's emotions and how those emotions are connected to the problem and solution in the text. 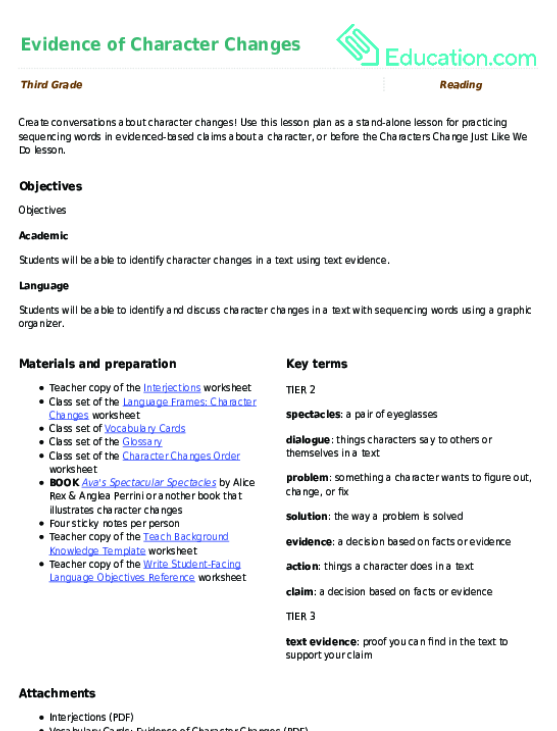 Distribute the Character Changes Order worksheet and read the directions. Ask students to cut out the sentences and circle the sequencing words in the explanation. Then, using the sequencing words as hints, place the sentence strips in the correct chronological order. Choose a volunteer to read their Character Changes Order worksheet aloud. Ask students to put their thumbs up, down, or sideways if they agree with the answers. Present the following question to the class: "Considering how Ava felt at the end of the story, do you think Ava will wear glasses at school tomorrow?" Allow students to share their response with their elbow partner. 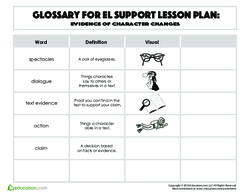 Use this glossary with the EL Support Lesson: Evidence of Character Changes. 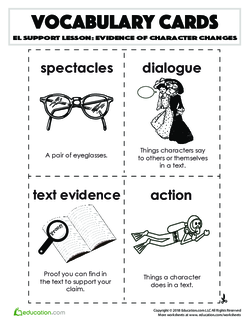 Use these vocabulary cards with the EL Support Lesson: Evidence of Character Changes. Create conversations about character changes! 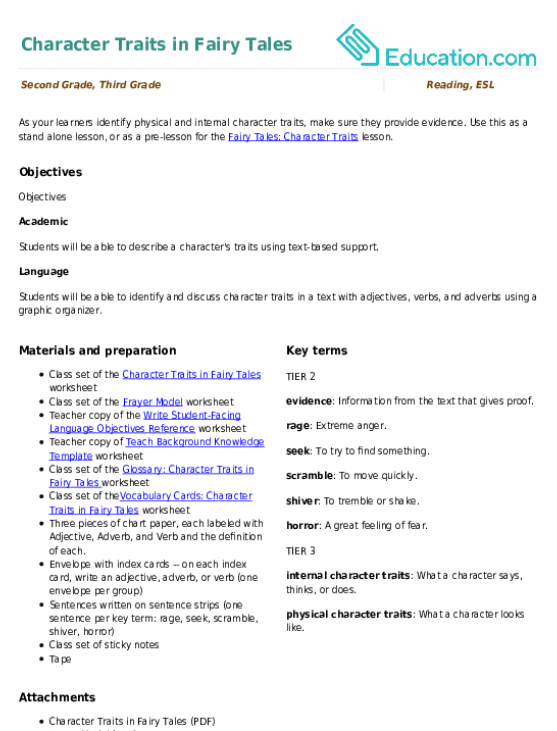 Students can use this graphic organizer to consider various elements of a character's development throughout a story. As your learners identify physical and internal character traits, make sure they provide evidence. 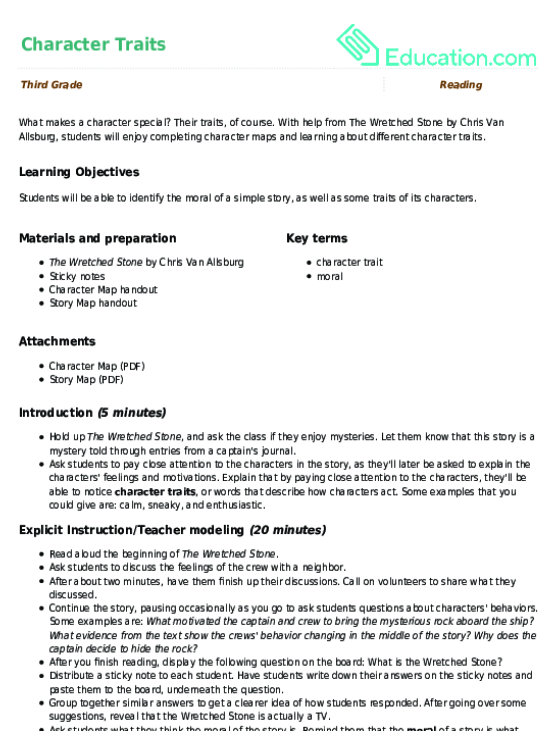 In this lesson, your students will determine how a character changes throughout a story by focusing on the character’s dialogue and actions. What makes a character special? Their traits, of course. 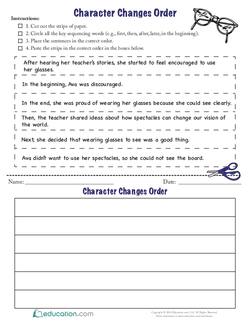 With this worksheet students will use evidence from a text to make a prediction about a character’s responses. Help students make the connection between a character trait and the words or actions that support it by using Character Cards.